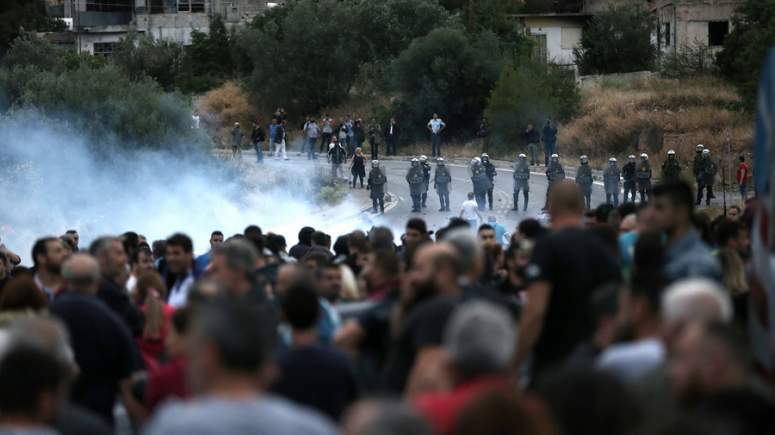 According to first information, which were published in the mainstream greek mass media, a riot occurred on Saturday, June 10, in Menidi on an anti-Roma rasist demonstration for the death of an 11-year-old pupil by a stray bullet, durring a school end celebration. The racist mob, aprox. 1500 participants, threw Molotov cocktails at the house of a Roma family, which one of the members is suspected to be the perpetrator of the murder. The riot was the signal for a generalized pogrom against the Roma living in the area. The next day, June 11, the racist mob, aproximately 200 people attempted to attack the Roma community area during a racist rally held for the second consecutive day. Two Roma houses in the area of Avlis in Menidi, suffered serious damages according to the Police, which proceeded to five detains. The anti-Roma pogrom continues in the absence of the anti-fascist and anti-racist movement. 2 Comments on Athens: An anti-Roma pogrom continues for a second day. Reblogged this on Der Paria.